The Airbus A340-300 is the new flagship of the SWISS fleet. The first of 12 new A340s joined the airline in July 2003. These aircraft will be used on the long haul network accommodating 8 First Class, 48 Business Class & 172 Economy Class seats. I was all tickly and couldn't await the arrival of my Swiss A340 program. And boy it was worth the wait - fantastic crew, fantastic flights and everything very well presented. Bonus sight seeing tour was great too as I'm planning to go to Bangkok myself one day. Anyways it's a great feeling being part of the flights for the duration of the DVD - excellent job once again, keep up the great effort. I really enjoyed this DVD and I am glad to have it alongside the MD-11 program. I liked the airport action at Zurich showcasing the variety of aircraft types in the Swiss fleet. 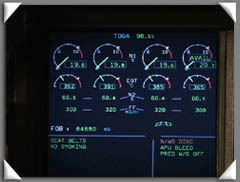 The new glass displays on the A340-300 look amazing. We had a very thorough explanation of the panel by both pilots and this is great for flight sim users, the aspiring pilot or for the extreme enthusiast. The calculation on the laptop for takeoff was also interesting to observe. I found the tour of Bangkok to be very nice. Lastly, the VOR approach into Zurich to end the video was great for it showed the amount of work involved to execute it properly for noise abatement and other related regulations in southern Germany due to the time of day that the landing took place. Some very interesting camera work was also shown on this DVD and made it enjoyable to watch. This DVD was fantastic and I will continue to buy this series because you learn something new every time you watch and good value for money. I would like to thank you lot once again for the great DVDs you are producing. Im a World Routes Addict. I have collected a total of 8 DVDS and have just ordered WinAir,Aer Arran & Air Calin. My wife has said that if I continue to watch these DVDs then she will LEAVE ME......God Im going to miss her!!! This is my first JustPlanes DVD and it will not be the last. Great presentation. I have watched this DVD four times so far and I just got it three days ago. Captain Stefan and the crew were just great. The overview of the cockpit and flight planning was terrific. 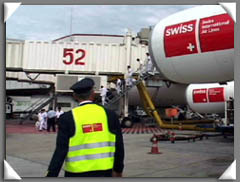 I loved the landing preps for both Bangkok and Zurich. What a great DVD!!!! Everything is very well presented, like the cockpit and cabin controls. I was especially impressed with the LCD displays on this aircraft. To me, LCD displays make the cockpit look better. Nice tour of Bangkok too. One of the best things about this aircraft and DVD is the engines' sound on takeoff. You just can't get any better! Great job to the camera crew and World Air Routes! Once again, good job!!! I really love this DVD. The Swiss Crew are just amazing. There are detailed explanations of setting up the FMC prior to a flight, a great cockpit presentation and walk around, and of course great views on approach into Sao Paulo and Buenos Aires. Well done World Air Routes and thank you to all the SWISS crew. I am emailing to compliment you on your World Air Routes series of DVDs. I currently have 18 programs from the World Air Routes series and will continue to buy more as they are released. I am very pleased and happy that there is a company which produces DVDs tailored to my interest in commercial aviation. 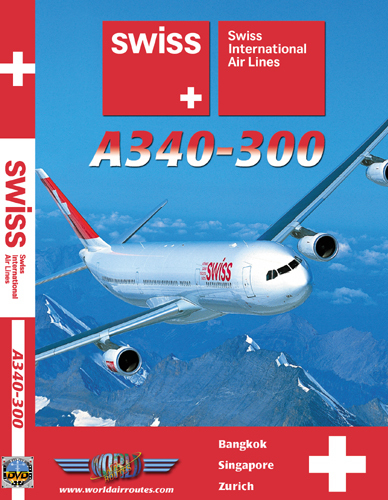 In my opinion, the 'Jewel of the Crown' of the World Air Routes Series is the Swiss A340 DVD because of it's detail and crew participation in presenting so many different areas associated with operating a large airliner on long haul routes. The filming is also brilliant, and I like the way that each take-off is viewed from a different camera angle because it avoids the take-offs being repetitive to watch. I also like the way that there is filming in many locations as well as the flight deck such as galleys in the cabin, crew briefing areas and airport terminals. All of your programs I own are absolutely fantastic and I always enjoy watching them. Please continue to produce them! Thank you very much. Wow!!! Another great video!! 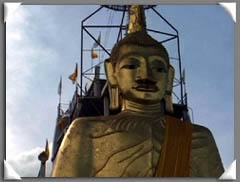 I especially liked the tour of Bangkok. Brought back memories of my trip there in May 1989. I've enjoyed all of your fantastic DVDs that I've purchased. Continued success!!! A pretty nice DVD. The explanation of the route both before the flight and enroute, specially over Afghanistan is very detailed, as well as approach at Bangkok. 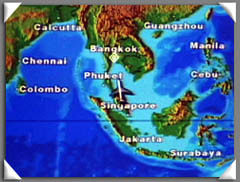 The BKK to SIN flight also is very interesting, shows in good detail the service and the work in the passengers cabin. And the approach to Kloten airport, excellent job, excellent explanation. Very nice DVD. In the last 2 weeks I have watched the BWIA A340-300 DVD 4 - 5 times. 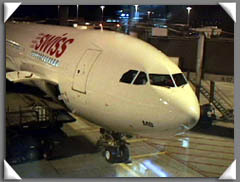 In the last 3 months I have watched the Swiss A340-300 DVD at least 20 times. And I can't count how many times I have watched the Air Tahiti Nui A340-200 DVD nor the Sabena A340-200 video. Anyway, I have enjoyed all four. Special thanks should go to the people responsible for the filming. My complement to Cpt. Conrad (Swiss), F/O Lehman (Swiss), Cpt. Heath (BWIA), F/O Williams (BWIA), and all of the pilots/cabin crew for their contributions. While the 747 has always been my favorite aircraft I have recently become a fan of the A340, thanks to Justplanes. 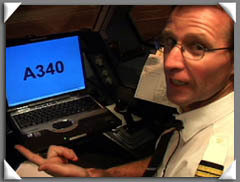 I hope that justplanes will release more DVDs featuring the A340. I have nothing but very sincere compliments toward this Swiss A340-300 DVD. The DVD should be praised not only for its superb contents, the enthusiasm of the Swiss crew, the quality of video and audio reproduction, but its vast improvement in cinematography techniques compared to previous JP productions. I was most impressed by the A340 cockpit presentation and level of attention to technical details was second to none. Overall, it is an absolute pleasure to own this DVD and please do keep up the good work, JP! I just wanted to express my congratulations to these amazing DVD's!! You have a done a wonderful job. I bought the Air Alps, South African, Swiss 340, HLX and Air France and I can just say that I will have the complete collection before the end of 2004!! A must for flight enthusiasts! An excellent DVD, I will rate this one 100%, the pilots do a superb job in explaining everything, the A340 is very impresive, the Cabin Crew give an excellent introduction, well done to the Camera Crew of Justplanes. Highly recoomend this DVD along with Qatar Airways. Well I think this DVD is absoutely fantastic. The cockpit tour is excellent,also when they do the walk around everything is explained in detail. Someone also mentioned about the certain procedures through Afghanistan was very interesting and I learn't something from that. The crew took their time in explaining the actual route which was also interesting. Overall view Excellent 10/10. I This in my opinion is one of the best productions of World Air Routes. The reason I like it so much is that it is not a 3hr DVD with as many flights crammed into it as possible showing the briefest of shots from departure to arrival. 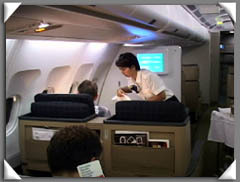 Each flight is throughly detailed with explanations from the crew members. You feel like you are actually there. The various heading changes required in order to avoid the CB's was very interesting. One thing that has sometimes frustrated me with previous productions is the camera man filming out of the side window when the aircraft is on final rather than concentrating on the runway ahead! Thankfully this does not happen in this DVD. Again you feel like you really are in that cockpit on final. Well done and thank you very much to you the SWISS crew (if any of you are reading this). I thought I was on each leg of this flight...a fabulous job on your presentation puts you right there! A good flight crew esp. the first officers...looks like Swiss has some good captains in their future. I'm still getting over the pilots and their work tables rather than the steering wheel up front....the sidestick reminded me of my son's video games. keep up the good work with the airlines and I'm always checking out whats coming up next. This is by far one of the best videos around. The walk around of the 340 was outstanding, the flight deck presentation was very well presented and the F/O demonstrating the computer that Swiss uses to compute the "V" speeds was very well presented. Overall this dvd deserves an A+. Keep up the good work. 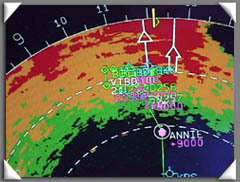 World Air Routes has again demonstrated why they are the premium cockpit video source for commercial aviation followers. The 3 hour Swiss DVD passed by almost as though the viewers were indeed on one of those flights and enjoying the remarkable scenery and very fine Swiss in-flight hospitality. As regular viewers have generally become accustomed of late to similar aircraft, cockpit tours, etc., World Air Routes seems to have adapted by including information explained from Captain Conrad on such interesting topics as noise abatement procedures for Zurich, German geo-political concerns for departures and arrivals, political and military concerns over flying Afghanistan, and an informative demonstration using an on-board laptop for take-off calculations. 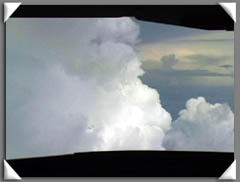 Additionally, the 4 take-offs in the program were shot from different views in the cockpit, one of which included a 45 degree angle view on Captain Conrad from powering forward to rotation. An excellent perspective!! 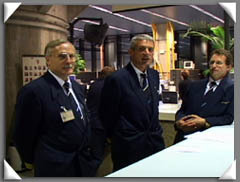 All 4 pilots working the 5 day turn around (2 Captains & 2 First Officers) were highly energetic and seemed considerate for the future viewers of the Swiss DVD. Once again World Air Routes has given us an EXCELLENT presentation with this Swiss Air A340 DVD. 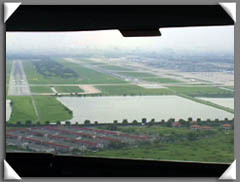 Outstanding presentations of the A340 cockpit, route of flight from Europe to the Far East as well as excellent scenery views of Bangkok. Simply put, this is a MUST HAVE DVD!!! Keep up the great work. I would like to thank all your crew. In my words this dvd is the best so far. Capt Conrad and his F/O really gave a excellent presentation of the Aircraft and Systems. The cockpit tour was great. The aircraft Walk around was quite interesting and thorough. The tour of Bangkok was interesting. The Swiss Fleet Part was really nice as well. I look forward to fly in the A-340. Keep up the Great Work. I Highly Recommend this dvd to All. A fabulous production on the Swiss A340-300! Very good presentation by the flight crew on the cockpit instrumentation and navigation and the cabin crew's presentation are very nicely done also. 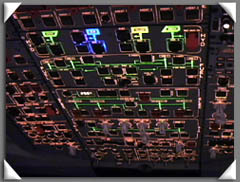 I'm impressed with the liquid crystal displays and didn't know that the newest Airbus had them until I saw this program. The walkaround inspection of the A340 is really nice to see and the sightseeing tour of Bangkok is lots of fun. Great job!